Well, the *rains and flood* effects seem to have subsided around here for now. Yea! Comp issues have settled down to a workable state. Though, I might be looking for a new one this summer. Even those nasty virus bugs (the rl un-healthy kind) have decided to go on their way, finally. Aygaren was getting frustrated with his adventureing interrupts and kept missing his Mt. Hyjal partner, Sasche. They finally did manage to meet up though, and finish off all the necessary shrine/ancient openings. They are quite the team in a way. Nothing stands a chance at survival when they drop in. I mean, really. If you're in some cultist encampment or holed up in some cave in force, and suddenly this Tauren prot pally and Undead demo lock w/void pet come calling....you may as well pack it in and go home. Death has come to clean house. The only real question is "Who's going to kill you first?" As you can expect, two short trips by this team and Hyjal was cleared for safe passage. At least for now. Sad to say, but Birzak and Gizzel have departed from the great Horde project. They were replaced by Olmer, an Undead level 3 hunter camped out in Undercity waiting assignment. The two departees were not the only fatalities. Several servers also saw major clean-outs. I guess spring cleaning came a bit early to Azeroth. 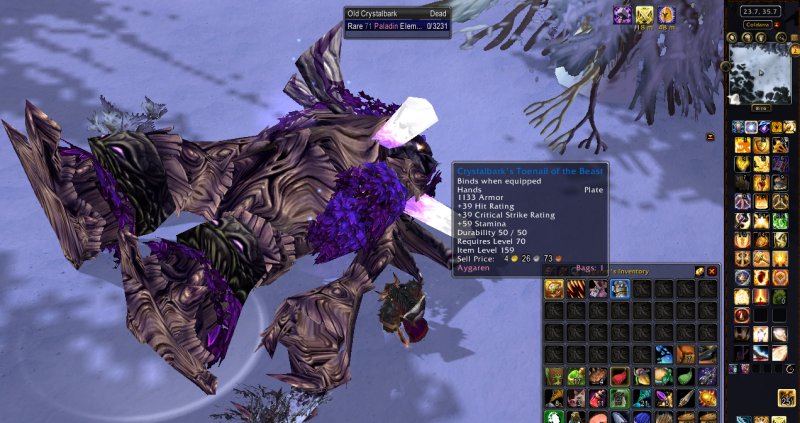 Aygaren and Dufit still have their little contest going on with killing rares. Aygaren has taken a large lead though, ever since his tactical move to include the Northrend hunting grounds. The last I checked in on their progress, Ay had twice as many kills listed. By the way, their little contest is being screenshoted and collected in the Fenris Rares Picasa web album here, if you would like to take a peek. I try to keep them labeled as to who killed by. And the map in upper right will give you co-ords of where. The other day I found Aygaren cleaning up his bank mess, grumbling and still itching that pesky bug under his plate armor. So I took a quick peek over his shoulder to see what he was hiding out. Nothing too amazing in there. Some low level armor pieces he thought might look good for mogging later on. Several plain letters from who knows who. Let's see, a virtual ton of ore and bars to feed his blacksmithy habits. Bunches of motes and volitiles that might come in handy. Spare food stuffs to cook, maybe. Old Crafty. And what's that in the bottom corner hiding out? Hmmmm? Four (yes, 4) extra fishing poles. Now, why on Azeroth Ay decided to keep all these fishing poles is a mystery. Really. He can only use one at any given moment. His backpack isn't large enough to allow carrying an interchangeable set on the road. Oh, and he's not talking about all those tabards laying around here and there. I foresee an intervention coming on here. Aygaren is going to learn about Void Storage. Soon, very soon. Aygaren rushed through Northrend, he wanted to be lvl 80. Then he wants to be 85 for Firelands. Then he wants to be geared for the coming Pandas. Then he wants to still master tanking. Then he wants....well, you get the picture. Like a little kid in the corner penny candy store, Ay just wants everything. I hate to burst his bubble, but the likelihood of everything coming about just isn't possible. Something will have to give. He keeps telling me all is good. I have my doubts though, as he was mumbleing something about Call to Arms weekend. Hurmph! He doesn't realize that he's got like zero (0) pvp gear. Anyway, I'm off to see what the boys are up to today. "Victory or Death", is the word of the day. Poor Ay, he needs someone to do a fishing pole intervention! My Druid had the same problem but she was storing Dumplings! Strange things abound! The poles are all soulbound so Ay opened up void storage. Two of the poles won't go in though. Apparently they are "Unique" classed, and unacceptable by the Ethereals. Needless to say, everything is back in Ay's personal bank again.